Check out this four-piece band from Ottawa. The Hilotrons were formed in 2002 by Mike Dubue and Paul Hogan. 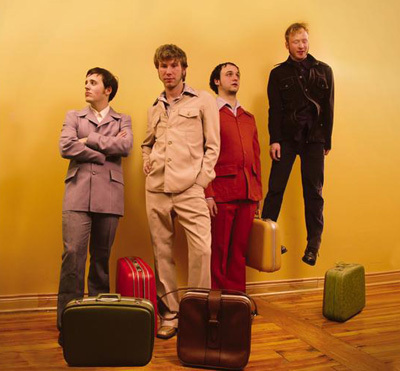 In December of 2005, the band put out Bella Simone, a record ‘full of upbeat, inescapable hooks and arrangements behind Dubue’s wonderfully unconventional vocal style.’ Known as one of the best live bands in Ottawa, be sure to listen to their record. Its quite a mosaic of sounds. Start from one extreme, take a listen to Look Wow. I swear this was a song in Revenge of the Nerds…. And end up at ‘Oh My‘ (Video), a slow song you might expect to hear off a Stars record. Check out CBC radio 1 this weekend for FUSE. The concept is great. Take two different bands, have them learn each others songs, and play them together in front of a studio audience. Should be great, turn on your radios.